Step-10. 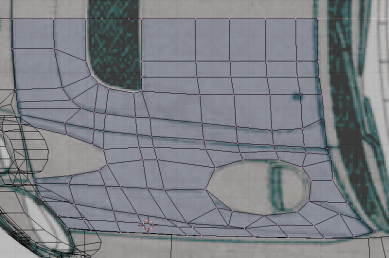 In top viewport select the side tire cover mesh and from inside part I.e. touching the bonnet cover Get into the edit mode and select the vertices then duplicate and separate them. 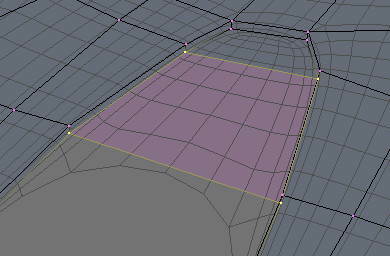 Get out of edit mode then select the single line mesh you separated for bonnet mesh see Image14. Image14. After bonnet, the mesh has been separated from the tire cover mesh. Highlighted portion in image14 reflects the edge of the tire cover mesh from which the side of bonnet mesh is derived. 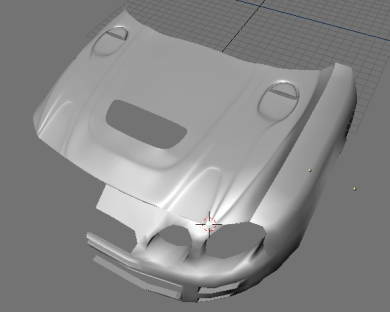 Get in front view then in edit mode and extrude the bonnet cover mesh towards the center of the car by leaving enough wires in the mesh so that bonnet cover can be modeled with ease (see Image15). Extruded it according to the number of vertices in the front bumper mesh below, while extruding also adjust the mesh inside viewport. Image15. Check the extrusion of vertices match the front_bumper mesh. Step-11. Get into the top viewport to check the mesh. 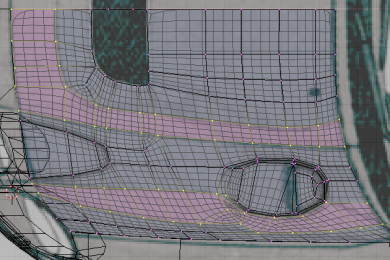 Now adjust the vertices which come near to the middle of the car body and align them in the straight line. (so that mirroring is easy later on). In the background image, you observe the contours of the bonnet cover. Image16 (click for big image) after adjusting mesh to follow the contours in the background. 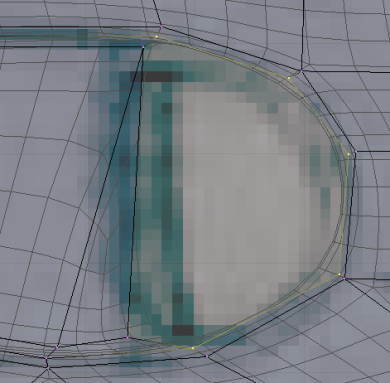 Before you go further, notice that in the image/blueprint the elevation for the curves on the bonnet is not very strong/sharp highlight so one extrusion in very smaller proportion (Keep pressed ‘Shift+Ctrl’ for smaller grid jumps while dragging or extruding) is sufficient. For most of the extrusions done in steps below take care of the distance, you extrude to. After achieving the mesh as in the Image16 proceed to design the air vent in the bonnet. 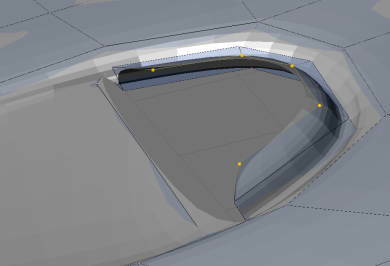 Select the internal vertices of the circle cut for the vent and extrude it twice in small steps down towards the engine inside or front viewport Image17a. Image17a. Extrusion for the air vent in the bonnet_cover mesh. 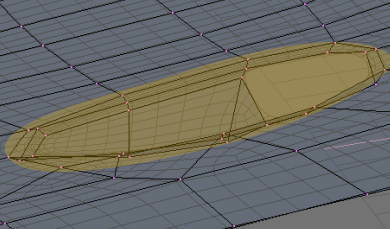 In top viewport join the vertices of the extruded lower half to make faces Image17b. Extrude the upper half upwards from engine twice, see Image17c. Join the vertices to make faces. Image17b. The lower part vertices are joined at the air vent. Image17c. Extrusion fo the upper cap of the air vent. Step-12. Now select the vertices of the front part of the bonnet as seen in Image18 and extrude them downwards just like the air vent. Join and complete faces. Image18. The Lower part of the bonnet cover meshes under work. Now a bit tricky part. If you had previously matched the contours right in Step-11 this will be easy. Get into the top viewport and select the group of vertices as in Image19 (click to get a bigger image). Go to side or front view port And extrude them upwards from engine once. Image19. The part of the bonnet cover mesh which is to be extruded. Step-13. The Image20 shows the bonnet cover after it had been mirror joined. And also the front bumper in shaded mode. Image20. The bonnet cover mesh in solid mode.